Our strategic focus is to support Local Public Health Agencies (LPHAs) in being (and becoming) Community Health Strategists in their community. Our approach to achieving our strategic focus is to build on areas of mutual interest where LPHAs can develop similar expertise and can organize statewide to advocate for additional resources and influence. We both support LPHAs at the local level and act on behalf of LPHAs at the state level. Following is a visual representation of our strategic focus and approach. 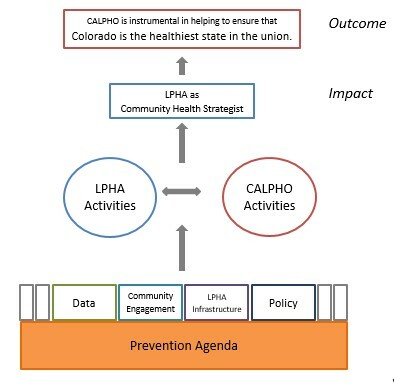 CALPHO is a state affiliate of the National Association of City and County Health Officials. (NACCHO) (pronounced nay-cho). Our work mirrors NACCHO's national efforts to be "leader, partner, catalyst, and voice for change for local health departments around the nation." > ​Learn more about NACCHO.